My Dad arrived last night for a few week visit. While he's here, I'll try to be mindful to have foods that aren't too hard or otherwise difficult to chew. He likes spicy food, but my daughter won't eat spicy food. I love how the Instant Pot cooks quickly and seems to intensify the fresh flavor of vegetables while softening the texture, which should come in handy with my Dad. I thought that I would use patty pan squash that I bought a few days ago at a farmer's market for a vegetable dish. Here is what I did. 3/4 medium red (or other) bell pepper, cut into strips approx. 1/4" (or slightly smaller) x 1"
I checked time required to cook under pressure. French lentils take about 15-20m, but conventionally cooked, with a 1:3 ratio of lentils to water, they only take a bit longer, 25m. I decided to cook lentils conventionally and then mix with the other vegetables, so combined the lentils and water, brought to a boil, then simmered, covered, for about 25m. Acorn squash chunks cook in about 6-7m, so I figured that patty pan squash, much less dense, would probably cook in about 4m if cut. Leeks take 2-4m and carrots 2-3m. I put the squash, carrot, leek, bell pepper, salt, water, and bouillon cube in the Instant Pot and cooked for 4m at high pressure. When I was ready to serve, I released remaining pressure to open the pot, mixed in the cooked lentils, lemon sage, and onion. 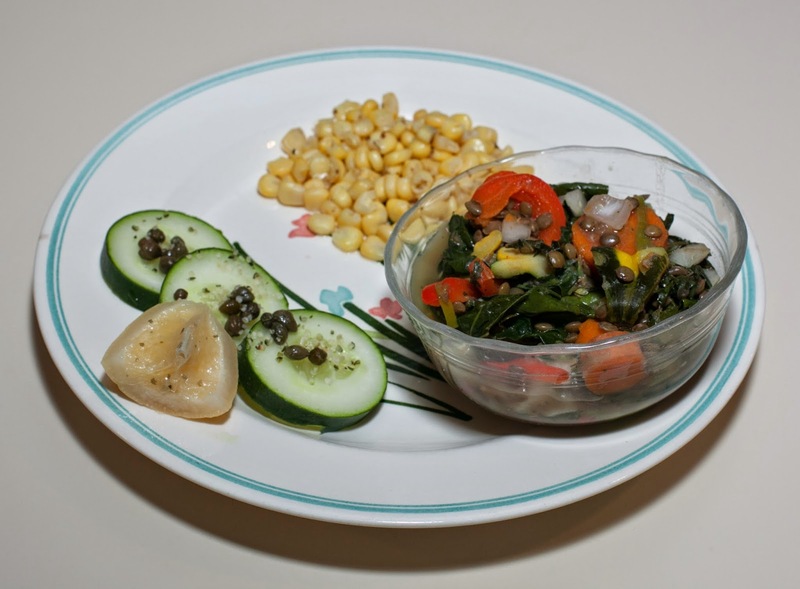 I also served some preserved lemon (it had a little olive oil so I describe the meal as "almost no added fat"), cucumber, and capers, as well as some corn kernels. I think that all enjoyed dinner, though my Dad, predictably, found the food needing some spicing. I loved the vegetables even before mixing in the lentils. The vegetables were just a tad juicier than I expected, hence the serving in bowls; next time, maybe I could get away with just a bit of water, perhaps 1/8 cup. I'd like to make more vegetable dishes, as the fresh vegetable flavor is so good out of pressure cooking. Maybe I could try a sauté in the pan, followed by pressure cooking including a sauce like marinara.